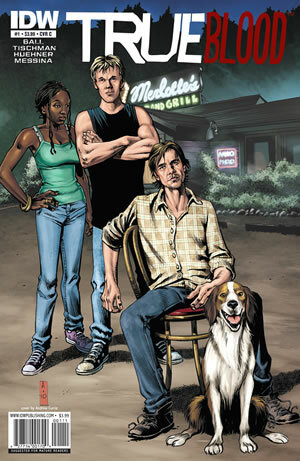 I’ve been waiting for some True Blood news to post, and I finally have some, though I wish I was more excited about it. 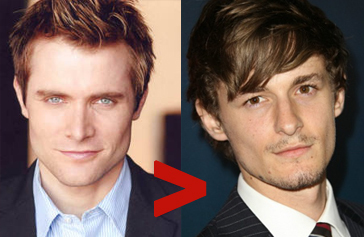 The role of Claude Crane has been recast! In the season 4 premier, the role had gone to Neil Hopkins, perhaps best know for his stint on Lost playing Liam Pace. His appearance as Claudine’s triplet Claude was a blink and you’ll miss it sort of affair, but people had been hoping he would make a return appearance. Well, the good news is that Claude will be returning, just not as played by Neil. No, the role has gone to newcomer Giles Mattey. I have to ask: WHY?!? Generally speaking, I’ve been pretty happy about the casting of characters established in the Charlaine Harris novels, but this one leaves me cold. Claude is described in the books as ‘hunky’, the kind of guy women and men would do a double take for. Hot and flauntingly sexual, Claude is a stripper who passes his daytime hours posing for the covers of romance novels – think Fabio only 1,000 times better looking. I’m not getting that vibe from Giles. I haven’t seen many pictures, but he does not seem to have the physique that one would describe as ‘hunky’ and he certainly doesn’t look like he spends his time stripping. Neil’s looks fit into what I think of as fae, his physique is nothing to sneeze at, plus I think he’s fairly believable as Claudine’s sibling. Neil Hopkins and Lara Pulver look to be the same age, where as I would place Giles as being about 5 years younger – maybe more. No mention as to whether Claude will be gay, as per the books, but reports are saying that Jessica will be taking an interest – which may work out well for fans if we don’t particularly like the character. I am going to hold onto my outright condemnation of Alan Ball’s choice until I see what Giles does with the role. I’ll give them the benefit of the doubt this one time. But I can’t say as I’m feeling all that optimistic about it. It’s Just Some Random Guy never fails to entertain. 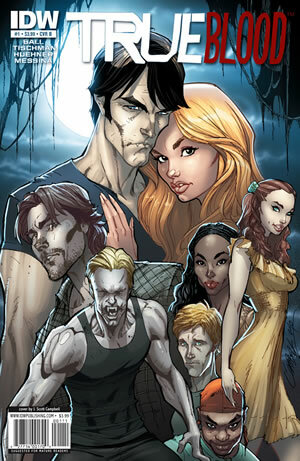 See what happens when he turns his jaded eyes towards the Twilight and True Blood franchises. Hope there’s a sequel! You can watch more Random Films on You Tube. Don’t Like the Taste Now That You’ve Taken a Swig? Remember last season, how Jason was so into killing? He saw it as something noble and righteous. Well, he’s not thinking those things now. Nice to see some remorse from him. I wasn’t expecting that. Ooooh, creepy. Poor Lafayette is still having all sorts of Pam/Eric problems. While I’m not happy with Tara’s apparent character arc, I like her strong and sassy, I must say that all and all, this looks absolutely fantastic. Love the peek at Debbie Pelt, Franklin Mott and Russel Edginton that we’re getting. Seems that their characters and roles have been beefed up considerably. And it’s also nice to see Sophie-Anne again. Next is a clip of Sookie confronting Eric about Bill’s disappearance. Six hours and he still scopes out Sook’s cleavage… TWICE! And finally there are some leaked photos of Sam and Bill experiencing a little of the same temptation as Sookie and Eric through their blood bond…. Ooooh, steamy! I know a large portion of the viewing audience is going to be excited about this. Will You Show Me Your Etchings? Much better – nice, simple and clean. 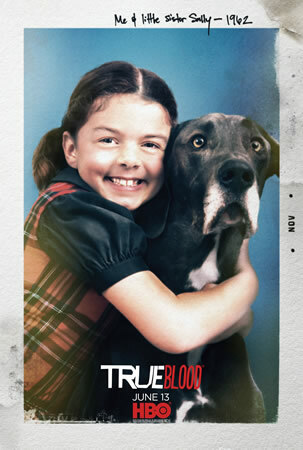 It seems that the True Blood posters are going the way of the Star Trek sequels, every other one is a dud. I’m beginning to think I should rename this blog “True Blood – All The Time” given the amount of TB related stuff I’ve been posting lately. Should I be dialing it back? While you’re considering, here’s the latest mini episode, this time starring our favorite canine. 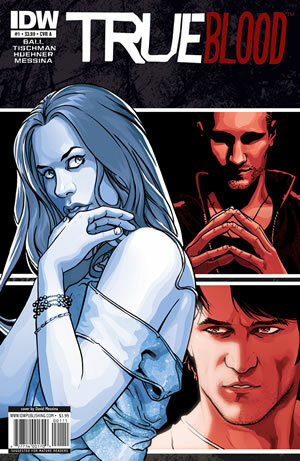 I mentioned a couple of weeks ago that there would be four alternative covers for the new True Blood comic series that debuts July 21st. So, what do you think? Which is your favorite? 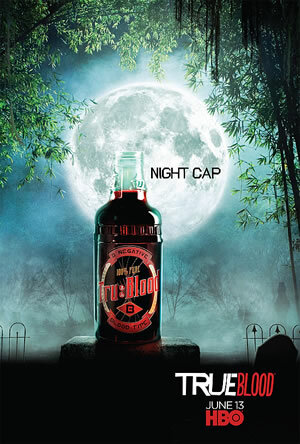 HBO is really cranking out the promos for Season 3 of True Blood. They’ve just released *another* trailer, this time showing more about Tara’s relationship with Franklin Mott (who is beyond skeezy – so much for the debonair elder gentleman) and Sookie’s search for Bill – I like her new take charge attitude. Plus Jason is back and as charmingly naive as ever. So, is this getting to be too much? Meh! 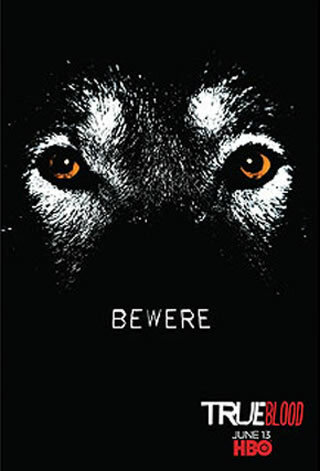 You would think the poster introducing the werewolves would be a little more interesting. I do have to admit, I like the play on words.